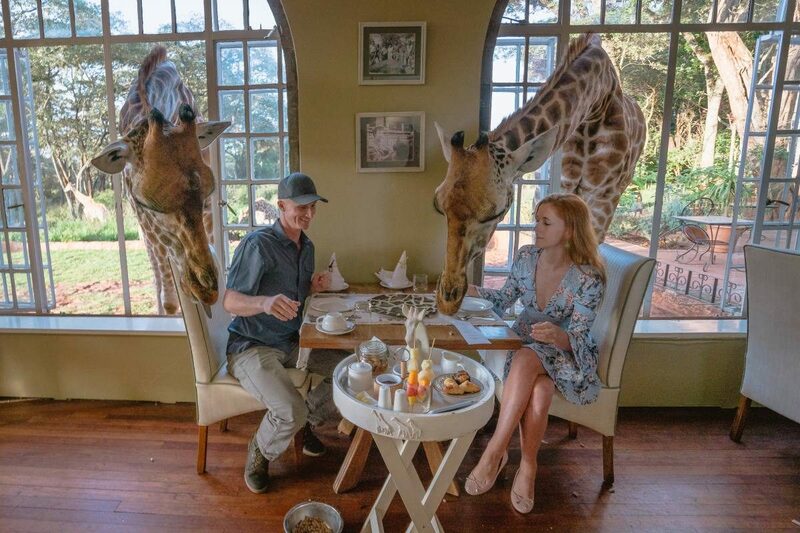 Giraffes sticking their heads through the windows for breakfast and reaching to your balcony… you might have seen these incredible photos on social media already. It’s the Giraffe Manor. When I first found out about it, way before Instagram was even popular, I was dying to go there. Sadly, during my visit to Kenya the hotel was closed for refurbishment. A few years later, the Giraffe Manor still remained on my bucket list. While the price for the night more than doubled since the first time I tried to stay there, this time you had to book at least half a year in advance, I made this visit happen for my honeymoon. Is the Giraffe Manor worth the money? I get it. Quite often some places on our bucket lists don’t turn out to be as cool as we thought they were. Since neither Matt or I were sponsored to stay there I could write absolutely anything I wanted about this place. I never write nice things about a hotel that wasn’t nice in reality even if I was sponsored to stay there, but I felt like some people might trust my opinion more if I stated the above. Fair enough. I’m pleased to tell you that the Giraffe Manor is absolutely worth your time and money. It surely didn’t disappoint me, and I believe I can say the same thing for my husband. 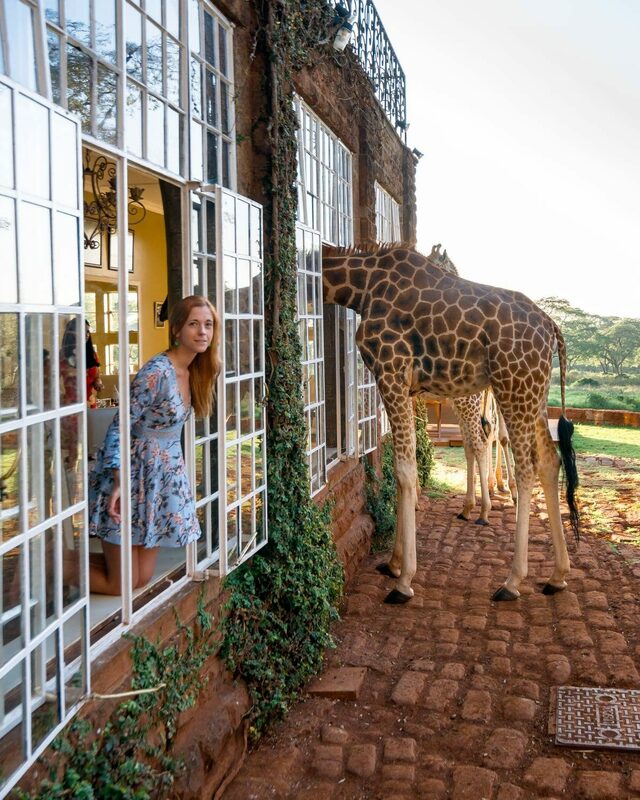 The Giraffe Manor is part of The Safari Collection hotel group that owns a few luxury resorts around Kenya. While the Manor is a luxury hotel, it’s surely not your usual resort. You won’t find a fitness center or a swimming pool there. It’s a restored 1930s mansion that’s still family-owned, despite being part of the hotel group. Each room at the main house I stayed at is absolutely gorgeous (peeked into other ones). Absolutely everything. From dining and cocktails, through laundry services, wifi to airport pick-up and drop-off. Some of you might be scared off by the price, but all these things alone would cost a bunch elsewhere. 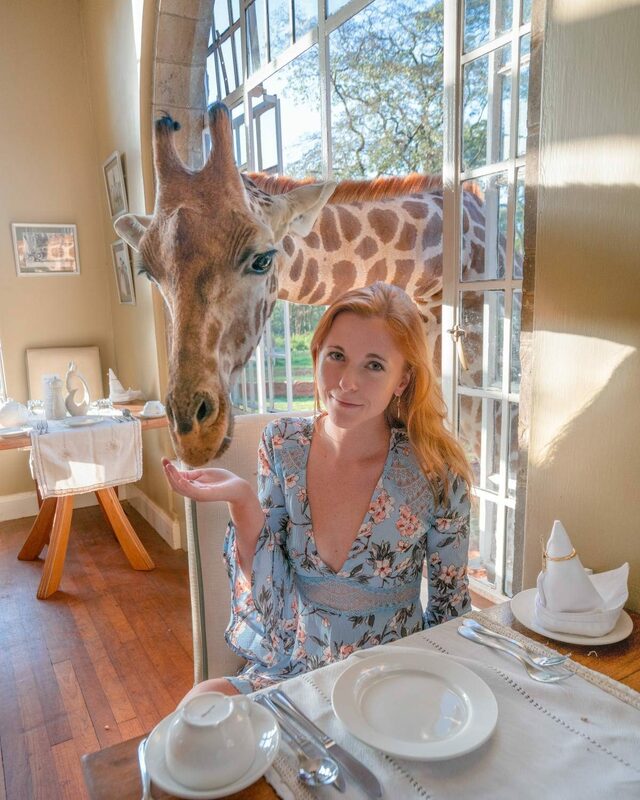 All meals at the Giraffe Manor were exceptional. You can have a choice of eating with other guests or have a more private set-up. During my visit, everyone opted for a romantic set-up, which worked for them as there weren’t any guests with kids at the time. However, if you’re coming for a couples getaway or honeymoon, keep in mind that kids might be running around as most of them obviously love the giraffes. The Giraffe Manor is home to Rothschild Giraffes, not the same ones that you can see in a local zoo or a safari. They’re one of the four types of giraffes and can be distinguished by their white socks. They’re completely free to do whatever they want, whenever they want since this place isn’t a petting zoo. The giraffes are used to human interactions, but don’t be fooled – they aren’t all friendly. The staff will be with you the entire time and tell you do’s and dont’s, because some of your new tall friends can headbutt and send you to the hospital if they like. 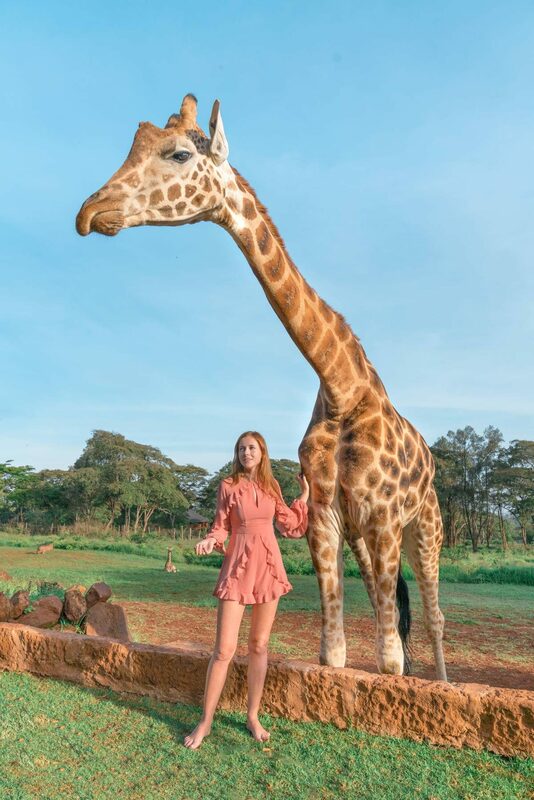 Together with Nairobi Giraffe Center located next door, The Safari Collection works to positively affect the community and wildlife. In addition, The Safari Collection works with different organizations that help the mere 20,000 lions and 7,000 cheetahs remaining in Africa. 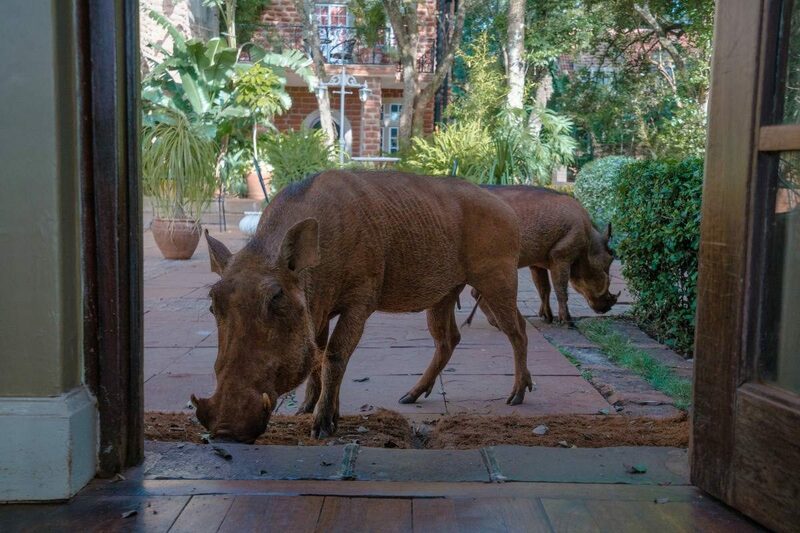 Apart from giraffes, the manor is home to a sounder of warthogs, better known as Pumbas from the Lion King. I’ve seen warthogs before in Zimbabwe and South Africa, but always from afar as they’re cautious with safari vehicles and humans. Not these guys though. They walked all the way to the window and doors and I was able to admire them closely. While ugly to some people, I found them ridiculously cute. They kneel down to eat the grass or leftover molasses snacks but run with their tails up. Between our arrival time around 11 AM and early afternoon, we actually did not see the giraffes. Instead, we found a jar in our room labeled ‘Don’t eat’, which turned out to be molasses snacks prepared for giraffes. Since the Giraffe Center is located nearby (you can see it from the hotel), the tall guys are hanging out there until the place close at 5 PM. I guess if I was a giraffe, I’d be where the snacks are too. While we waited for the giraffes a delicious 3-course lunch was served to us outside and we enjoyed the downstairs lounge with an open bar, books, and giraffe-shaped chess set. Right before 5 PM the guests are invited to the front of the house for an afternoon tea. We barely had time to eat our scones and drink the actual tea, as the hungry giraffes approached the building. They were surely expecting us to feed them, ready to eat from our hands and give us very slimy kisses. While giraffe’s saliva is antiseptic, I passed on the kiss. Once we ran out of snacks, the giraffes retired for the night and we were ready for dinner. Around 5 AM, one greedy giraffe stuck his head to our balcony begging for food. Once the sun is completely up, all the giraffes were ready for breakfast so all guests gathered in the dining room to share the meals. 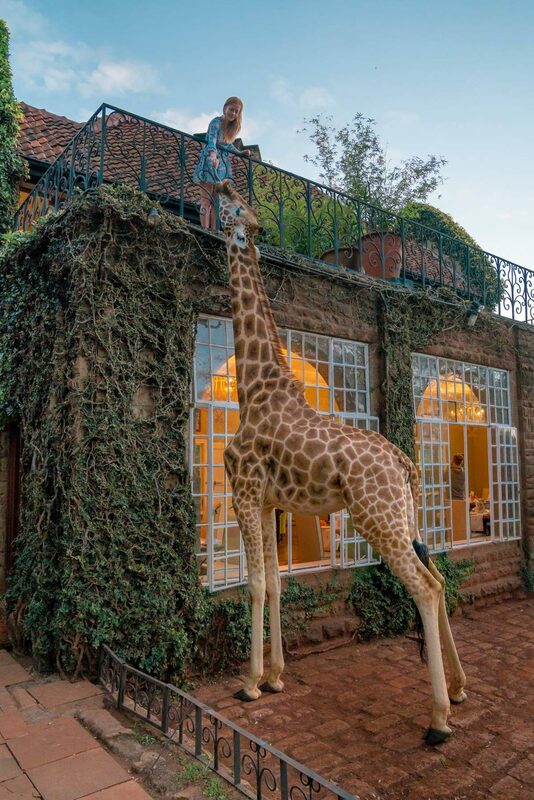 Sticking their heads through open windows, giraffes quickly cleaned up their plates. Hungry warthogs followed around, eating leftovers from the grass. The whole scene was definitely magical! Is one night enough at the Giraffe Manor? Totally. We arrived around 11 AM and left the next day at 10 AM since the check-out time is very strict. 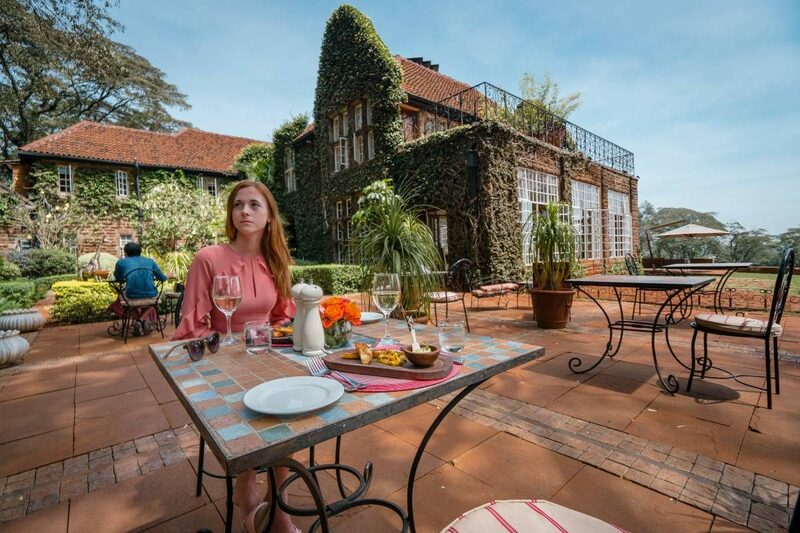 I felt like if we stayed for the second day, we’d want to arrange some special activities, like visiting David Sheldrick foundation with baby elephants, but we did it after check-out anyway without having to pay for an extra night. Do I recommend the Giraffe Manor? Absolutely! 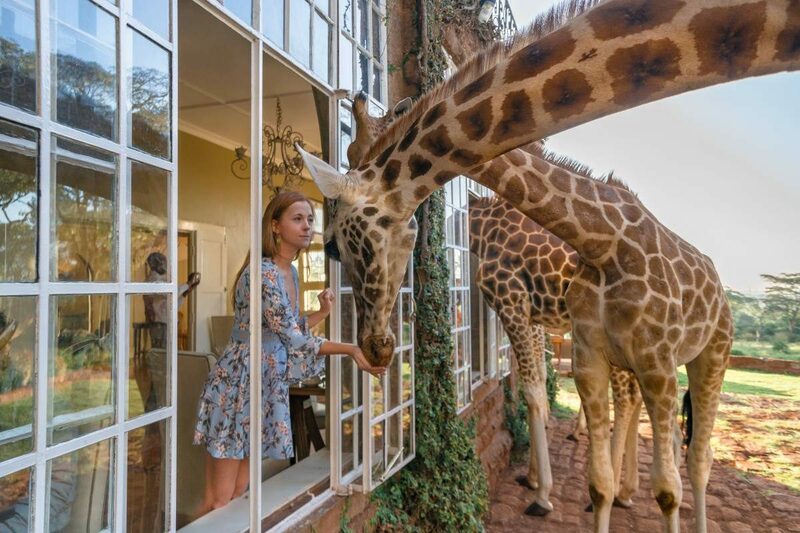 Whether you’re planning your honeymoon, want to bring children over, or simply you’re a big fan of giraffes, this unique hotel will satisfy your cravings. Check out their availability calendar here, but book in advance. Note that most of 2018 is already booked. 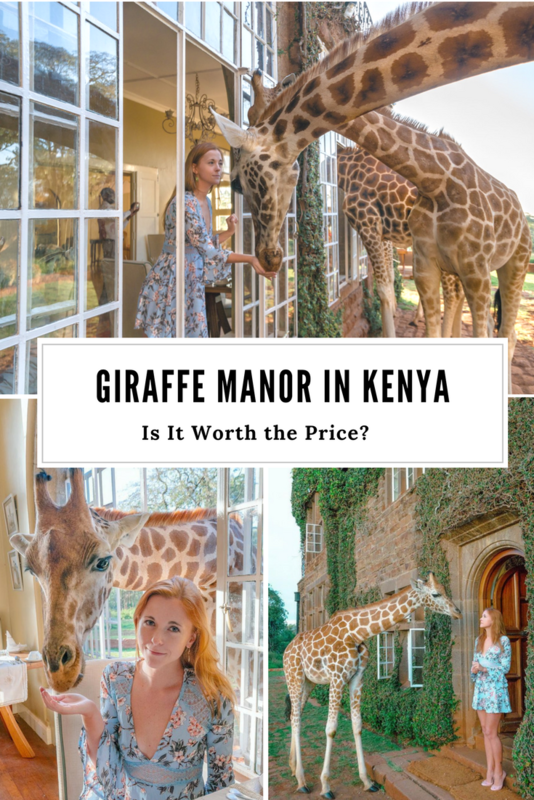 Any questions about the Giraffe Manor in Kenya? Let me know in the comments below! But did you get to eat Kenyan food like their special spicy meat samosas? Or irio? Or nyama choma? When I lived there (long ago! ), giraffes would graze in pastures with cows. It was quite easy to get up close to them, but not too close–they were wild. I had the spicy samosas, but not nyama choma that time. I think I had the Ugandan version of it, but wasn’t a fan probably because I’m not big on goat meat. This is SO on my bucket list! It looks like such an incredible experience! I just love this place and yes, it is worth the prize. Thanks for sharing these lovely photographs with us and I would love to make it to this place. Thanks for sharing your opinion! I love all your photos! I’m so glad it was awesome! I’ve been wanting to go there, but was kind of afraid it might be overhyped. I’ve also had this on my bucketlist since seeing some photos on the internet or social media, it just looks like such a quirky place, with Giraffes & Warthogs being such clumsy & friendly animals. I read the article twice, and see no reference to prices. The headline asks if it is worth the money, and you answer “yes,” yet no mention of cost is discussed. Even if I Google this place there is no mention of transportation, tips, side trips, etc. Why not? This is Africa – you ALWAYS tip the staff everywhere and there are tip boxes. It’s really exciting to get up close and personal with these gentle giants! I’m so thrilled for our trip there next year. Thanks for your wonderful feedback about the place Anna. Great read! I was there last year and made it next door to the giraffe center. It truly is an amazing experience. I am wondering something semi-related to your trip, but a bit more general as well. Can you speak on the trend of people really wanting to visit places like this. More of an “experiential” trip as oppose to the average “vacation”… It seems like people are urging to get out and do travel different. Where do you think this trend came from, or how do you think it evolved? People seemingly are wanting to be more hands on and in the middle of things more. Would you agree, and what else can you inform me on relating to this subject. I would truly appreciate it. After spending the night at Giraffe Manor there was no point of going to the Giraffe Center anymore as these are the same giraffes. At the manor you get more of an intimate experience. What currency did you tip in Kenya ? 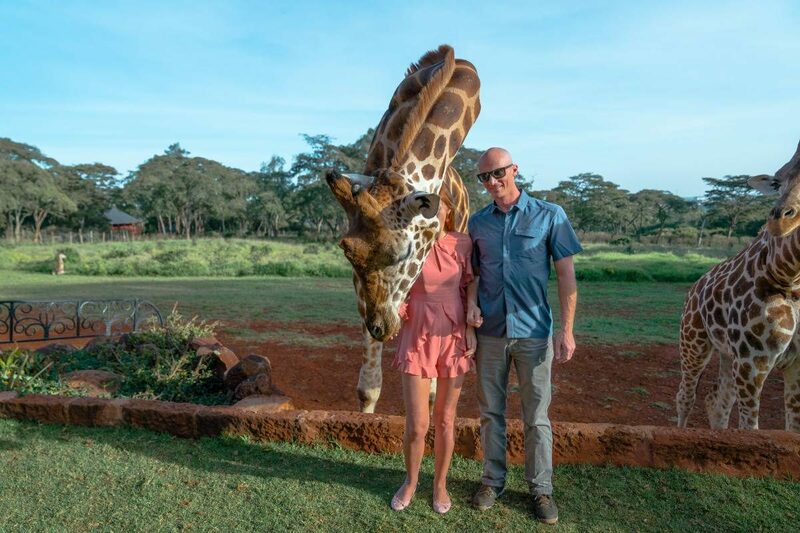 I’m at Giraffe Manor for 2 nights then we are going to South Africa.I don’t fancy changing to Kenyan Shilling as we won’t be there long.Would £ or Rand be ok ? Thank you . Always US dollars and you pay for most things in US dollars too no problem. I don’t know about Pounds.